And find out why it is frequently used in large corporate environment, by US Navy, Army and by many others. Advanced PowerPoint Exporter is now implemented as a part corporate design workflow. Design in Photoshop once, save it and it is available a PowerPoint template for all SharePoint users. 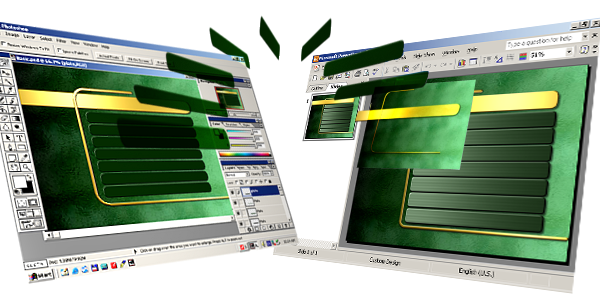 Design in Photoshop and save your desing for PowerPoint in just one click! It is a new powerful tool that fully automates all manual work and handles all technical issues when you transfer layers from Photoshop to PowerPoint in a most elegant way. It provides "Save as PowerPoint..." functionality to Adobe Photoshop! If you have ever exported layout designed in Photoshop to PowerPoint you know how cumbersome and time consuming this task may be. You have to export each layer as a separate picture, and then to import each of those pictures into PowerPoint, place them at the same position where they ware in Photoshop resize them … You also have to pay attention to lots of technical details regarding picture DPI and file format. And as if this is not enough all of this differs when you take into account different versions of Photoshop and PowerPoint. Download ZIP file containing two Photoshop files, and try to export them manualy to PowerPoint. You will see how cumbersome this may be. Advanced PowerPoint Exporter - Designed to solve this problem! Advanced PowerPoint Exporter will transfer whole Photoshop design into PowerPoint compatible HTML file which can be directly opened in PowerPoint. It will preserve layer structure (each layer is exported as a separate clip), position of layers, transparency and effects... It will also handle all technical issues for you. All you have to do is to pick a name for the presentation. And for such a powerful tool it is surprisingly easy to use. It seamlessly integrates into any existing workflow and works without a glitch. After a while you won't even notice it is there (except if for some reason you are forced to work without it). Alternative to using this tool is time consuming tedious, error prone manual work, or accepting quality level that PowerPoint has to offer. Anyone can use it. All technical details and headaches are handled by plug-in. You can forget about incompatibilities in transparency, scaling, positioning, DPI's... between different versions of Photoshop and PowerPoint. This tool will handle that for you. Advanced PowerPoint Exporter cuts usual working time to a fraction of percent previously used and basically it pays for itself within several hours of use.